Ivan V Alekseyevich (Russian: Иван V Алексеевич, 6 September [O.S. 27 August] 1666 – 8 February [O.S. 29 January] 1696) was a joint Tsar of Russia (with his younger half-brother Peter I) who co-reigned between 1682 and 1696. Ivan was the youngest son of Alexis I of Russia by his first wife, Maria Miloslavskaya, while Peter was the only son of Alexis by his second wife, Natalya Naryshkina. Ivan's reign was only formal, since he had serious physical and mental disabilities. Ivan V was born in 1666 in Moscow, the youngest son of Tsar Alexis and Maria Miloslavskaya. Only two of his older brothers survived childhood; his eldest brother, Alexei, died aged 15 in 1670, therefore his second brother, Feodor III, became tsar upon the death of their father. When Feodor III died in 1682, at age 20, without leaving an heir, Ivan, who was thought to be "infirm in body and mind", was passed over in favor of his younger half-brother, Peter I. The church and the Naryshkins (family of Peter I's mother, Natalya Naryshkina) supported Peter's ascension to the throne, however, the family of Ivan V's mother (the Miloslavski) and Ivan's older sister, Sofia Alekseyevna, in particular, disputed the move. Rumors spread around Moscow that Feodor III had been poisoned and Ivan strangled by boyars so that the 10-year-old Peter could become Tsar. These rumours fomented the Moscow Uprising of 1682, and the streltsy stormed the Kremlin. These disturbances subsided only after Ivan appeared in person in the city, and proved to everyone that he was alive and well. The streltsy demanded that Ivan be named tsar, and a compromise was found by declaring Ivan and Peter as co-rulers, with a regency government until the boys came of age. 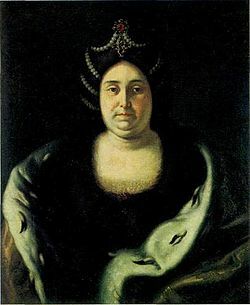 Sofia Alekseyevna, who had been influential at court during her brother Feodor III's reign, was named regent. On 25 June 1682, less than two months after the death of Feodor III, Ivan and Peter were crowned in the Cathedral of the Dormition as dvoetsarstvenniki (double tsars). A special throne with two seats was commissioned for the occasion (now on display in the Kremlin Armoury). While Ivan was 16 years old at this time, his co-ruler Peter I was only 10. Ivan was considered the "senior tsar", but actual power was wielded by Sophia Alekseyevna, Ivan's sister and Peter's half-sister, for the next seven years. Sophia was always considerate of Ivan, although she is never known to have consulted him on any important matter. She was anxious that every outward sign of respect and deference be paid to Ivan, which was a subtle way of undermining the influence of Peter's faction in court. Thus, every wish or opinion expressed by Ivan was deferred to, and his general prestige in court remained intact during the years of Sophia's regency. As Peter the Great grew up, he and his faction, led by his mother's Naryshkin family, contended with Regent Sophia for influence and power. Indeed, Sophia is blamed for the murders of Peter's uncles on his mother's side of the family. Due to this and other situations, tension arose between the supporters of the co-tsars. In 1689, Peter was 17, and intent upon declaring his majority and demanding power. To pre-empt this, Sophia attempted to raise a riot in the city, spreading the rumour that the Naryshkins had destroyed Ivan's crown and were poised to set his room on fire. This was untrue, and when riots began, Ivan's tutor, Prince Prozorovsky, persuaded him to publicly declare his faith in his brother Peter and make it known that he was unharmed and in no danger for life or liberty. Ivan did this, and also supported Peter's contention that the time had come for terminating the regency. Peter was declared to be of age and Sophia's regency was terminated. Ivan being both incapable and disinterested, Peter came into his own and functioned as though he were the sole tsar. The eventual result was that, over time, the outward signs of deference and power which Ivan had enjoyed during the regency slowly withered away and he became a non-entity in the Russian court. For the last decade of his life, Ivan was completely overshadowed by the more energetic Peter I. He spent his days with his wife, Praskovia Saltykova, caring about little but "fasting and praying day and night". At the age of 27, Ivan was described by foreign ambassadors as senile, paralytic and almost blind. He died two years later, on 8 February 1696, and was interred in the Archangel Cathedral. It was fortuitous to Peter's faction that Ivan produced several daughters but no sons, as there was no confusion regarding the succession of the crown upon his death. His co-ruler was left to become supreme ruler of Russia. The struggle for power within the family had finally ended. In 1730, more than 30 years after Ivan's death, his second surviving daughter, Anna, Duchess of Courland, was invited to the throne of Russia by the country's privy council. She ruled for more than 10 years, and was succeeded by Ivan's infant great-grandson Ivan VI, but a palace coup engineered in 1741, by Ivan's niece Elizabeth resulted in the throne passing finally to the progeny of Peter the Great. ^ Kelly 1854, p. 226. ^ a b Thackeray & Findling 2012, p. 19. ^ Kelly 1854, p. 227. ^ "Ivan V Alexeevich". www.kreml.ru. Retrieved 2017-11-03. ^ Thompson, John. Russia and the Soviet Union: An Historical Introduction from the Kievan State to the Present. New Haven, CT; London: Westview Press, 2008 (paperback, ISBN 0-8133-4395-X). Kelly, Walter Keating (1854). The history of Russia from the earliest period to the Crimean war. H. G Bohn. Thackeray, Frank W.; Findling, John E. (31 May 2012). Events That Formed the Modern World. ABC-CLIO. ISBN 978-1-59884-901-1.